I recently changed drive shafts, ball joints, inner/outer tie rods (with boots) knuckle bearings, hubs, end links and control arm bushing on front end of my Type SH Prelude. It needs alignment now. After all the work was done and I took the car for drive round the block, the steering is really weird. From 10 to 2 o'clock it's fine but any more turn and it feels loose and start going by itself to 6 o'clock. At the same time the power steering fluid in the reservoir is bobbing up and down even when the car is idling. Any ideas? Air trapped in system? or something mechanical? You have air in the power steering system. As for the way it feels/handles, unless you're confident in your ability to do a quick DIY alignment, do not drive the car until it's properly aligned. Alignment did help fix the weird pull issue. But now to drive straight you need to move the steering wheel a little to the right, lol. Also, the guy said he can't align the rear since it needs a camber kit??? Its lowered on BC coilovers and has stock wheels. I also asked him about it being TypeSH and he said its same alignment specs as normal, I'm like then why does the sheet say "...except TypeSH"? Last edited by Bobbit; 07-14-2017 at 10:10 PM. Can anyone make sense of above alignment numbers? good? bad? Inspect that front right suspension. Being off over a full degree looks a bit odd, almost as if the upper control arm was either replaced at some point - or is worn. Caster seems odd as well. I believe SH Preludes do have different alignment specs... especially since parts of the suspension differ between the base (such as the difference in camber allowed by the upper control arm and difference in radius rods). But since you've altered the ride height already, I can't see it making that much of a difference. The rear camber is right, and he is correct in it needing an adjustable balljoint to fix it - You could raise the car a little and have it re-aligned, leave it alone, or get the adjustable balljoints. 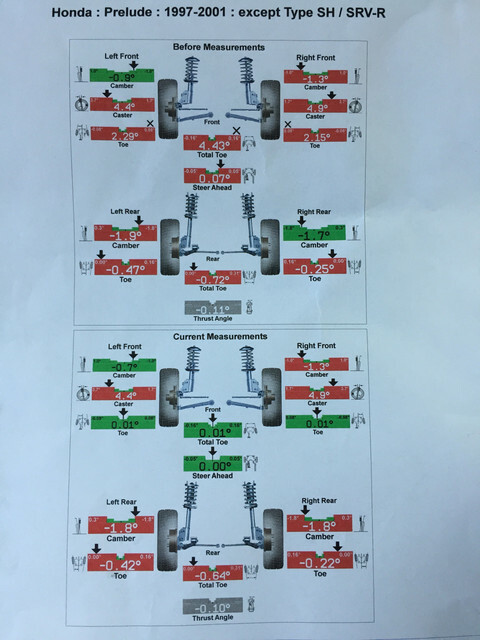 So if I'm reading the above numbers correctly...adjustable ball joints with lowering springs affects camber quite a bit and coilovers helped to rectify that somewhat? I did change upper control arms to aftermarket ones. However during reassembly left side UCA ball joint thread stripped and had to buy an aftermarket ball joint to replace it. Do you believe right side UCA number could be due to replacement? or incorrect assembly? Should I fork out for adjustable front and rear upper ball joints? Plan is in the near future to put some wide tyres, thinking 17" diameter and 8.5"-9" width. So would this make plan justify spending cash on adjustable ball joints?